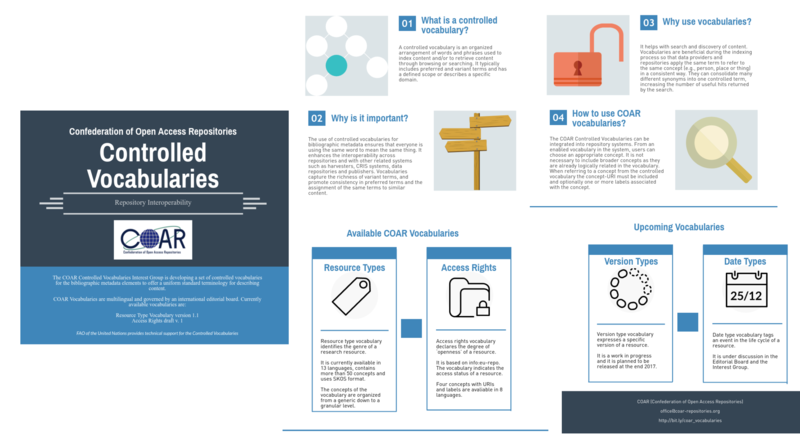 Did you know that COAR Vocabularies on Access Rights and Resource Types are already referenced in the updated OpenAIRE Guidelines for CRIS Managers and OpenAIRE Guidelines (v.4) for Literature Repository Managers? Moreover, COAR Controlled Vocabularies INFOGRAPHIC (EN) is now also available in Spanish (ES) and French (FR) languages. Learn more about COAR Controlled Vocabularies and make sure You get everything ready to make the best possible use of them. COAR Controlled Vocabularies: What & Why & How? As currently the usage of consistent controlled terms is still not widespread across repositories, and these latter often use local terms and/or tend to apply too broad concepts that do not qualify the resource properly, standard and widely-shared controlled vocabularies may bring many benefits for harvesters. These vocabularies are going to be continuously revised, updated and maintained by international community of practice. At the technical level, the COAR Controlled Vocabularies are edited in VocBench and described in SKOS, where concepts are identified using URIs. Besides, labels to the concepts can be offered in multiple languages, notes are allowed for description, as well as different annotations and concepts from other vocabularies can be linked. COAR Controlled Vocabularies Interest Group (IG) aims to improve existing vocabularies, develop new ones in the need of the repository community, broaden the language diversity and ensure wide adoption of the vocabularies. If you are interested in joining the COAR Controlled Vocabularies Interest Group, please send a message to the office@coar-repositories.org or to IG chair Jochen Schirrwagen. … by the most commonly used free and open –source repository software is a way to enhance the interoperability across repositories (and their content), and with other related systems such as harvesters, CRIS (Current Research Information Systems), data repositories and publishers. *** Resource Type Vocabulary is already implemented in the DSpace repository of University of Minho and in the Phaidra Classification Server of University of Vienna. *** The COAR Vocabulary on Access Rights is recommended for the German Core Dataset on Research Information (Kerndatensatz Forschung). *** Implementations of COAR Vocabularies at national and international level in the case of RCAAP in Portugal, JPCOAR Consortium in Japan and LA Referencia in Latin America also proved the need for and the benefit of COAR vocabularies. The Editorial Board is currently developing FAQs to support the implementation of vocabularies in repositories. Last but not least. If you like to contribute to the translation of COAR Controlled Vocabularies INFOGRAPHIC, please request access to edit this text file. Read more on COAR Controlled Vocabularies and feel free to spread the word !